The EZ-EFI 2.0® Fuel Injection System from FAST revolutionized not only the fuel injection market, but fuel injection system looks as well. This EZ-EFI 2.0 TBI-Style Throttle Body allows any XFI 2.0-equipped application with a 4150-style carb flange manifold to achieve the looks of EZ-EFI while maintaining XFI power and versatility. The package includes the new EZ-EFI 2.0 throttle body, plus the connector & harness needed to hook up it to an EFI system. It is good for systems making up to 1,200 horsepower and flowing 1,150 CFM. It comes completely assembled with the harness installed. The customer only needs to wire up the mating end of the connector utilizing the included diagram. 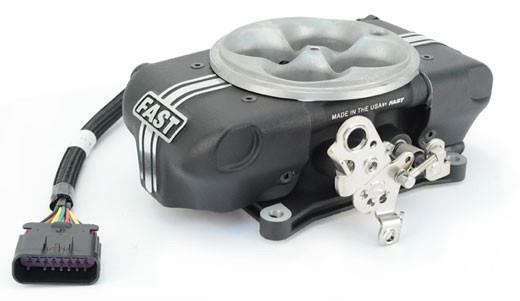 The FAST EZ-EFI 2.0 TBI-Style Throttle Body For XFI Applications includes eight 74 lb./hr. high-impedance injectors, along with TPS, IAC, IAT and one-bar MAP sensors. Users will have everything they need to make lots of horsepower and look good while doing so.